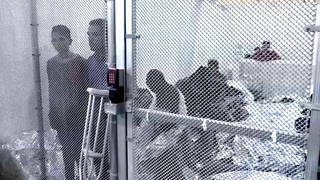 “Lost in Detention”: As Obama Admin Deports Record 400,000, Film Explores What Immigrants Face Behind Bars | Democracy Now! award-winning broadcaster. Her documentary, Lost in Detention, aired this week on the PBS program Frontline. She is president of the Futuro Media Group, anchor and managing editor of NPR’s Latino USA, and host of WGBH’s Maria Hinojosa: One-on-One. AMY GOODMAN: We turn now to federal immigration issues. Juan? JUAN GONZALEZ: Well, on Tuesday, the Obama administration released new figures that show U.S. deportations of immigrants are at a record high. The Immigration and Customs Enforcement agency, known as ICE, says it deported nearly 400,000 people in fiscal year 2011, the highest total in the agency’s eight years. The data was released on Tuesday, the same day a coalition of Latino and immigrant rights groups held a National Day of Action to protest President Obama’s immigration policies. The protesters called for an immediate end to the Secure Communities program, which requires local police to forward fingerprints of every person they arrest to the U.S. Department of Homeland Security. More than one million immigrants have been deported during the Obama presidency, even as efforts to reform immigration policy have languished. The record-high numbers are examined in a new episode of PBS’s Frontline. Here’s a clip from the program, starting with comments from Obama’s director of intergovernmental affairs, Cecilia Muñoz. AMY GOODMAN: We’re going to try to get to that clip in a minute. But why don’t we turn right now to Maria Hinojosa, who did Lost in Detention, award-winning broadcaster, president of the Futuro Media Group, anchor and managing editor of NPR’s Latino USA, host of WGBH’s Maria Hinojosa: One-on-One. It’s great to have you with us. Talk about this documentary you did for Frontline. MARIA HINOJOSA: You know, it was an amazing documentary. We spent about a year doing a deep investigation into what is happening right now with the policies under the Obama administration. We got extraordinary access, because we never gave up and continued pushing. So I would say that at this point, Amy and Juan, as journalists, we have probably seen more than most people, because we’ve seen the entire circle, from the knock on the door at 6:00 in the morning with agents from Immigration, though they’re wearing outfits that say “police” everywhere, the then detention of that person, where they’re detained, the detention centers, the conditions in the detention centers, and the impacts of what happens in the communities when these parents often are ripped outside of the home. So we’ve seen quite a bit. And it’s—it is in fact shocking. AMY GOODMAN: Let’s play that clip—we have it now—with the—starting with the comments of President Obama’s director of intergovernmental affairs, Cecilia Muñoz. CECILIA MUÑOZ: As long as Congress gives us the money to deport 400,000 people a year, that’s what the administration is going to do. MARIA HINOJOSA: That figure of 400,000 a year is a target number, a goal. It’s set by ICE, Immigration Customs and Enforcement, based on the agency’s annual appropriation from Congress. MICHAEL ROZOS: Once you tell Congress a number, they’re fixated on that number. So, if you were to say 400,000, well, that’s etched in their mind. They’re going to give you the resources to get the 400,000. But you never go back to Congress and say, “Oh, by the way, we weren’t able to meet our goals,” and then expect the next year is going to be as resourced up, if you will, as the previous year. AMY GOODMAN: That was Michael Rozos, former ICE field officer, speaking on this new PBS Frontline documentary, Lost in Detention, Maria Hinojosa its correspondent. AMY GOODMAN: Your response to that? MARIA HINOJOSA: To what Mike Rozos said? I think Mike Rozos gave an amazing interview, because Mike Rozos, essentially, he helped write Secure Communities, that is now being enacted and is so controversial. Mike Rozos is one of those—he’s a career ICE guy, so he understands the business. And he told us very truthfully what goes on. And he said—he said, “Look, you know, if you don’t show these numbers, you know, it’s a problem.” I said, “Well, you mean what kind of a problem?” He’s like, “Come to the office at 9—come up to Washington, D.C., and explain yourself: how come you haven’t deported this number of people? You’re supposed to be held to a quota.” The administration says that’s not true. We have paperwork that says it is. JUAN GONZALEZ: And the irony of Cecilia Muñoz talking about this deportation program when not only is it at record levels, but the reports that I saw said that about 93 percent of the people deported were Latino, even though Latinos represent only about 65, 67 percent of the undocumented population of the country. So not only is it massive deportations, but it is especially disproportionately targeting the Latino community. And you have someone like Cecilia Muñoz, who used to be a leader of the Latino community before she entered the Obama administration, defending it. AMY GOODMAN: —in the history of the country, under President Obama. MARIA HINOJOSA: And you know what? As journalists, what we have to do is we have to do our job, and we have to tell this story. And there is not a lot of light on this story. Most networks don’t even want to touch this story. It’s a difficult story. There’s all kinds of reaction. We have to do our job shedding light on the truth. JUAN GONZALEZ: I wanted to ask you about the Willacy Detention Center, because, again, this is another—I know Willacy County well. Raymondville used to be the mushroom capital of the world, where the Texas Farm Workers organized more than 30 years ago. And now Willacy has become the center of these enormous abuses. Could you talk about some of what you saw, especially with women and other folks in the detention centers? MARIA HINOJOSA: Juan, you know, you know that I’ve been covering the story of immigration for 25 years, OK? And you would think that after 25 years of covering this story it gets better. Unfortunately, in this situation, the story has gotten worse. The things that I heard—and many of it—much of it didn’t end up in the documentary, because we had to do an hour investigation onto a bunch of things. We could have done just an hour on Willacy. For example, the mental health coordinator, African-American woman, who starts hearing from detainees that they’re getting fed food that’s rotten, that’s spoiled, that’s uncooked, that has worms in it. And she says, “I don’t believe it, I don’t believe it, I don’t believe it,” until one day, she says, one of the detainees comes in and brings a napkin and lets the napkin open, and in it there’s garbanzo beans, and there are maggots, live maggots, crawling in that. And this is what they’re expected to eat. The fact that we know that a former ICE official went down and asked for everybody to be weighed, because when she went in—and she understands corrections, this is Dr. Dora Schriro here in New York now, who heads corrections—she said, “I want to see the weights of everybody, because people here look gaunt, they look depressed.” Everybody had at least lost 10 pounds, at least. Stories about women who are being sexually assaulted by the guards. When they want to complain, they are told, “Don’t complain, because it’s going to get worse for you.” “What do you mean it’s going to get worse?” “You’ll get deported.” Talk about a situation where you have a population that could be victimized. And then, if they want to complain, and they try, and they’re deported, what happens to the case? The case goes away. It’s like you’re really just disappearing complaints. There were 900 complaints, grievances, filed at Willacy. Only four of them were addressed. And the Obama administration has a Department of Homeland Security official, an ICE official, saying to us, when they get an audit that says they’re good, that they’re good. AMY GOODMAN: And the sexual abuse grievances, specifically? MARIA HINOJOSA: The sexual abuse grievances from the ACLU, we found over 170 cases, complaints of sexual abuse over the past several years. We found at Willacy over a dozen. I spoke personally with two women who were sexually assaulted by the guards at Willacy. And the fact that they just—they don’t have, in fact, any legal recourse, which should be of concern, not for immigrants, but for all American citizens. AMY GOODMAN: One of the women you talked to begged to be deported? MARIA HINOJOSA: She begged to be deported, because she was so afraid of this. And this is what happens. Is there coercion happening? She left behind American citizen children. So what is happening when you have people who have lived here—she had lived here for more than a decade, Canadian, a Caribbean Canadian—and now she says, “I’ve got to get out of here. Get me out of here.” And that kind of case, the “get me out of here,” I heard former guards tell me that that happens all the time. AMY GOODMAN: Maria Hinojosa is the correspondent on this new Frontline documentary called Lost in Detention. She is president of Futuro Media Group. You can watch the film in its entirety on _Frontline_’s website.